"Originally built in 1907, it [155-157 Chandler Street] was used by Linde Air Products until the early 1950s, and then by Bell Aircraft Corp. for several years. It was acquired in 1958 by Donald Rosen and used for machine shop G&R Machinery until the 1990s." 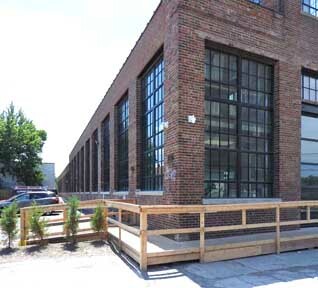 ... the Linde Air Manufacturing complex at 155 Chandler Street which will soon become headquarters for software development firm Utilant, a current tenant at his Foundry Lofts project. The sprawling complex will also be home to ceramic technology firm EnrG. Unlike Utilant’s flashy office space (with interior garden), EnrG is shaping up to be more of an industrial work site with lofted offices. Other tenants within the building include Barrel + Brine Café and Taproom, BlackBird Cider Works, a tax accountant business, and a call center.